The Wellness Movement supports New Brunswick’s Wellness Strategy by being a common platform and connection point for wellness in New Brunswick. 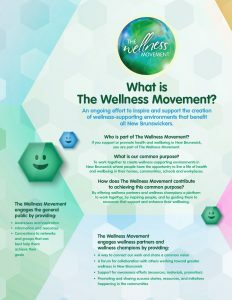 The Wellness Movement supports, connects, and celebrates all New Brunswickers – individuals, families, community groups, schools and workplaces – working on enhancing one or more aspect of wellness. As part of their contribution to New Brunswick’s Wellness Strategy, the Department of Social Development’s Wellness Branch supports these focus areas: mental fitness and resilience, healthy eating, physical activity, and tobacco-free living. The Wellness Movement celebrates the people and places that support our well-being. Everyone has a role to play. This website provides you with the inspiration to start your story by profiling stories in your community and directs you to tools and resources to help you, your family, your community group, school or workplace take your next step on your path to wellness. Help grow The Wellness Movement in New Brunswick. Share your story!